Arlington Bowie Boys and South Oak Cliff Girls Track Teams Named Beasts Of The Week! 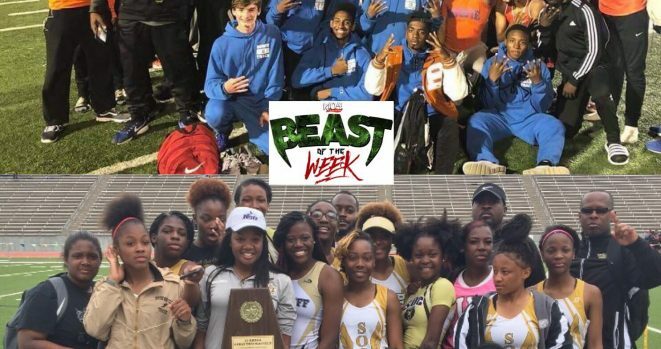 This week’s K104 “Beast Of the Week” golden spikes go to the Arlington Bowie Vols and South Oak Cliff Lady Golden Bears Track Teams for winning their District Championships over the weekend! Arlington Bowie Vols – Bowie locked their fourth, yes, FOURTH straight District Championship over the weekend. Gold medalists for the Vols included Ryan Williams (110 hurdles, 300 hurdles, and he was the anchor leg on the 4×4 gold medal relay team) and Isaiah Patterson (800 meter). South Oak Cliff Lady Golden Bears – SOC scored a combined 178 points at their District Track Meet and will advance to the Area round Track Meet. The Lady Golden Bears earned multiple gold medals on the day, including Alexius Pickens in the shot-put and Egypt Ase in the pole vault.